Five bars aluminum checker plate: five bars non-slip aluminum plate is also known as willow-shaped checker plate, with good anti-skid ability, and is widely used in building (floor) platform design etc. As the aluminum plate surface pattern is in accordance with the five concave pattern in accordance with the relatively parallel arrangement, and each pattern and other patterns between the 60-80 degree angle, so this pattern has excellent anti-skid performance. Domestic use of such aluminum is usually used as anti-skid, with a good anti-skid effect, the price plus cheap. Compass aluminum checker plate: non-slip aluminum, and five bars to play the same effect, but not often used. Orange peel aluminum checker plate is divided into: the classic orange peel pattern aluminum and orange peel orange pattern (also known as insect pattern). Its surface showing a pattern similar to orange peel, so called orange peel aluminum checker plate, which is commonly used aluminum checker plate products in refrigerator, air conditioning and packaging. 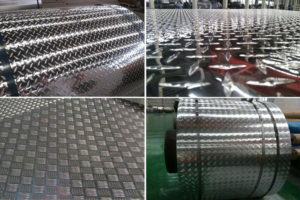 Lattice type aluminum tread plate is a commonly used anti-slip aluminum models, with a good anti-skid effect, mainly for the car, the platform non-slip, cold floor floor non-slip, workshop floor non-slip, elevator anti-skid aspects. haomei Aluminum produces diamond aluminum checker plate, two bars aluminum checker plate, three bars aluminum checker plate, small five bars pattern aluminum plate and large five bars aluminum tread plate . haomei Aluminum has a strong strength, with 1.3 million production base, “1 +1” “1 +4” continuous casting and rolling production line, access toaluminum foil foil research center and many other honors, product quality assurance.